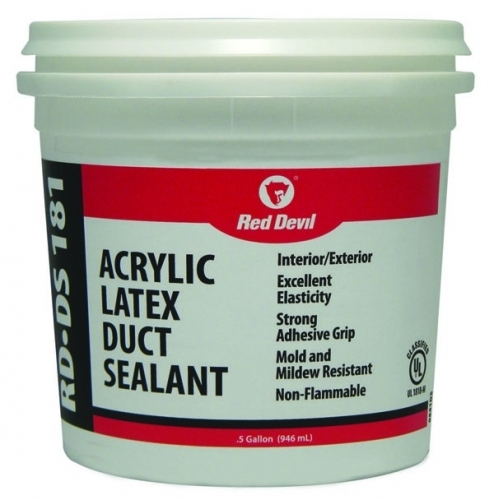 RDDS 181 Acrylic Duct Sealant is a gray water-based duct sealant used in medium and high-pressure duct systems. It is a special formulation which is non-flammable and provides permanent flexibility, excellent water-resistance and superior sealing strength. Use it to seal metal to metal joints to prevent air leaks in medium and high pressure systems of spiral and rectangular ductwork for air-conditioning, refrigeration, ventilation, and air distribution. 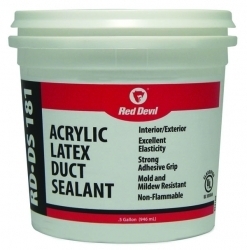 RD•DS 181 may also be used to seal joints on run-outs of connecting metal flexible tubing. Cured sealant is mold and mildew resistant.